Our grateful thanks to all our supporters and our loyal volunteers who helped on the stalls. Thank you to all our friends and supporters who purchased our 2018 Calendars. Total raised on the day £1,201.40 We have also had a few cheques & on line Bank donations from supporters that were unable to attend. ​Our grateful thanks to each and everyone. DAVE SPIKEY " WORK IN PROGRESS"
Our Patron Dave Spikey has come up trumps yet again. ​Total raised £886.90. Our thanks to all who supported us. ​Surprised us by donating this Gigantic Andrex promotional soft toy. We have since sold him for a whopping £75 to help the other pets in our care. He has gone on to a lovely new home at a Childrens Nursery where he will have plenty of hugs & TLC from his new companions. Thank you Tesco and Andrex's new adopters. Joanne Lane's son proudly showing off the lovely portrait of Grace alongside the real Grace. ​Our thanks to Artist Frank Morton. ​Kay chose 4 small prints - 2 Black & White and 2 colour as she was spoiled for choice. ​Louise Bentley, Freddy's owner, sadly lost him shortly before we drew our Grand Raffle in which she won the 1st prise of £250 towards Vet Bills / Pet Insurance - kindly donated by our sponsor Global Gas. 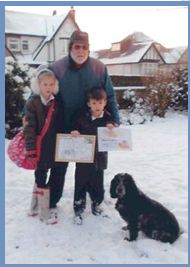 Louise asked us to use the prize money in Freddy's name to help other needy pets in our care. ​Thank you Louise & Rest in Peace Freddy. A great day made even better with good weather especially for the occasion. Craig Withers, one of our supporters, raised £260 from friends and workmates who generously sponsored his run in aid of Pet Rehome. Craig admitted that it was a hard slog but he was determined to complete the course to raise as much as possible for us. Thank you Craig you are a hero. made £152.20 on our tombola. Our thanks to the organisers of Golden Days. We raised the grand total of £647 from ticket sales. Our thanks to Jollyes for their kindness in allowing us to take part in their special sale evening. 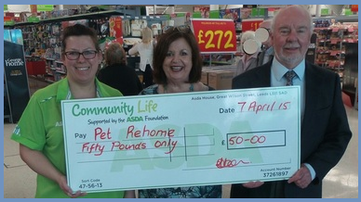 ﻿Val raizd a fantastic £555 to help the animals requiring aid and veterinary treatment. and the wonderful people who help us on our stalls. and an extra big thank you to all our volunteers. Thank you yet again to all our valued supporters. and the hard work of all our volunteer helpers. Many thanks to all our loyal supporters who turned up and spent their money on our goodies. We had a record breaking event and raised £1,480.45 to help us continue with our rescuing work. 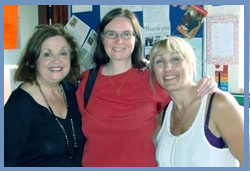 Heather (Centre) from Cheatham Hill. 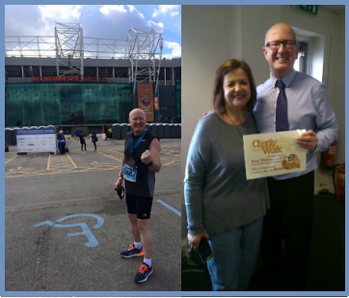 ​We are very grateful to both the following people who did the Manchester Run and raised sponsorship money for Pet Rehome. Okay for the first mile. It was all going well and then I felt a tear in my calf and then hobbled and cried the rest of the route. I was so so disappointed and after all the training I was really emotional too. My leg is really sore but as Ronnie said I did it and finished. The good news is I am definitely doing it again next year so I will look after the T-shirt. I have a bee in my bonnet and I have got to beat my times over the last 4 years. Paul did the Manchester run knocking 8 minutes off his record in 2008.
have helped the charity with their good work. Paul raised £108. who run Ye Old Pastie Shoppe in Bolton. the sun shone and a great day was had by all & raised £127.50 for the Charity. Day 1 : It was really hard work, not that you can tell from the photographs, but I certainly felt the burn the next morning. I needed two hands to lift my fork when I got home and couldn't text because my hands and arms had turned to rubber. I am looking forward to the rest of the course, getting fit and hopefully making lots of money for the animals in Pet Rehome 's care. Day 2 : My husband had to physically push me out of bed because my hip joints were killing me. The worst thing is trying to lower myself on the toilet seat Omg it is so painful!!!! Day 3 : It was so wet on the grass yesterday so we all had muddy bottoms, knees, backs & hair. Please God it doesn't rain the next time. Day 4 : Loads of floor work again. I am having to use the dogs as a Zimmer frame when I take them out for their walks. Day 5 : Sometimes you have a great idea then half way through you think again and come to the conclusion 'It was a great idea ..... for someone else !!! But hey ho soon be over and I can have a holiday and the animals at Pet Rehome will be better off with the sponsor donations from all the kind people who have cheered me on. Day 6: Training called INSANITY and believe me it was. Had to work with head torches. Photographs are few as most nights we were doing the training sessions in the dark. Day 7: Couldn't sleep last night as my legs were still dancing. Got home tonight wet through and filthy from lying in the mud. Got home and straight in the shower cloths, shoes and all. Did my neck in last week but getting better slowly. Thank God for my large dogs that help pull me up & down. Only another week to do. Phew! Day 8: After injuring myself last Friday I was told I had to rest up over the weekend Boo hoo! so today I have returned and omg! it was hard work the ground was really wet and muddy again. My knee and ankle are giving me gip but soon be over. My new winter training gear has been well and truly christened! So muddy the sludge wouldn't go down the plughole in the shower ! ​We raised whopping £500 from the sale of the tickets. Our thanks to everyone who supported us especially Frank for his generous donation and time. for the many animals we care for and re-home. 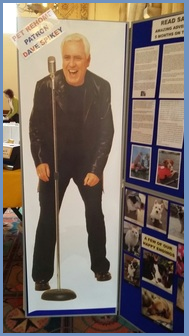 Dave's Charity Show was at Market Drayton were he kindly donated all his profits from the show. Thank you so much Dave we don't know what we would do without you. of the raffle held on the night. Caricature Painting of Dave which Dave donated & signed. donated by The Festival Drayton Centre. What a generous man. Thank you. for best fancy dress. (Rag doll). 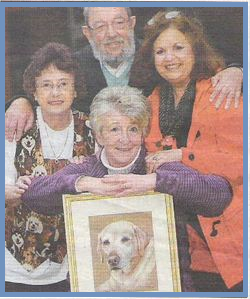 his wife, Kay, have taken in several older dogs over many years. 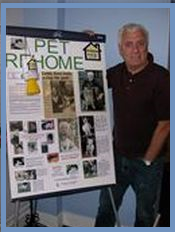 Older pets often get overlooked & are desperate for a caring environment to grow old in. 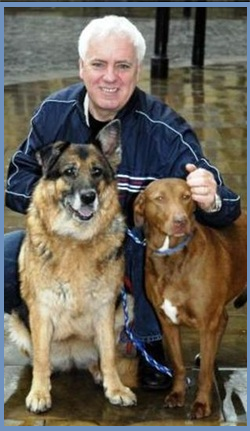 Pet Rehome are urging people to give the oldies a chance.